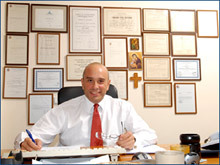 The Founder and the Managing Director of the Law Firm is John M. Tripidakis, a lawyer with 30 years of legal experience. Born in Athens, Greece on 1958, Mr. Tripidakis has been educated and trained in Greece, Switzerland, the U.K, and the U.S. He has worked in Greece, U.S. and Australia. He was born in Greece and speaks English, Greek and French. Mr. Tripidakis has successfully represented thousands of foreign citizens from the U.S., Australia, Europe and South Africa of Greek heritage on their legal matters in Greece. As an international Estates lawyer, he specializes in Estate Planning and Administration, as well as real estate property transactions in Greece. Mr. John Tripidakis is member of the Athens Bar Association and he is an Australian registered foreign lawyer with the Legal Services Boards of Victoria and New South Wales, and an associate member of the Law Institute of Victoria. In other words, he is a Greek lawyer in Australia restricted to the practise of Greek law, but bound by the professional obligations and standards of Australian lawyers. • Bar-Bri course, in New York City, in preparation for the New York Bar exams.